Operating in the modern digital business world increases the importance of business agility, for example, in terms of customisation, availability and scalability. The requirement for modern information systems is to have the capability of delivering business value considering contextual variations such as, business models of the suppliers, user preferences and past activities, location, resource pricing and demand forecast, as well as local legislation and practices. The CDD (Capability Driven Development) methodology provides means for developing information systems meeting these requirements. The methodology enables development of context-aware and adaptive components for enterprise information systems. The methodology documentation is publically available at http://caas-project.eu/getting-started/. The development environment is created using open source technologies. Its description is available at http://caas-project.eu/tool-support/. RTU provides access to the environment in the SaaS mode un the access to the system can be request at http://cdd.vitk.lv/. RTU together with partners offers methodology application expertise and know-how. Feedback phase, where the system delivery experiences are accumulated and changes in the design are requested. Fig. 1. The main phases of the CDD methodology. 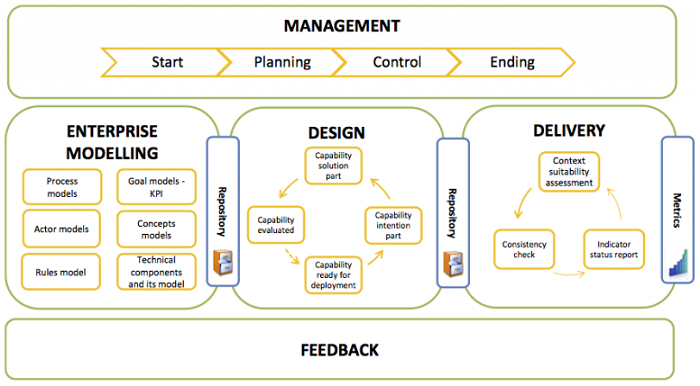 Capability Design Tool (CDT), an Eclipse based graphical modelling tool with a complete notation for Enterprise Modelling and Capability Design. CDT supports the creation of models (goal models, process models, concept models, context models, business processes and capability models) according to the capability meta-model. The CDT will provide to capability analysts a suitable set of tools for defining capabilities according to the best practices from the Enterprise Modelling domain. Capability Context Platform (CCP) is an application for aggregating and distributing context information from various kinds of sources, e.g. social networks, application data, and other. Capability Delivery Application (CDA) is an application used to deliver capabilities, developed and executed using the engineering process of capability owner/provider. In real case at runtime CDA can, for example, be an ERP system. This can be a custom-made system, or a configured standard system such as a SAP ERP. Fig. 2. Components of the CDD environment. Methodology is used for development of capable information systems. It is suitable for information systems dependent on volatile external influences, customized for application in different environments and requiring optimization according to specific performance indicators.